In the last decade, a total of 52,662 law graduates took the Philippine Bar Examinations in the hopes of earning the privilege to be called an attorney. The exam covers eight subjects from different fields of law: Civil Law, Commercial Law, Criminal Law, Labor Law, Legal Ethics, Political Law, Remedial Law and Taxation. To become a lawyer, the bar exam taker must obtain an average grade of 75 percent across all subjects. Only one out of four takers pass the examinations on average. From 2006 to 2016, the average passing rate in the bar exams was a mere 26.81 percent. Still, even when the odds seem to be against these law graduates, thousands still take the bar examinations to become one of the most respected professionals in the country. This November, a record of 7,227 law graduates are expected to take the bar examinations, the highest number in the past 10 years. Not surprisingly, the low passing rate has encouraged law graduates to devote a few more months after finishing school to review for the bar exams either with their school or with independent review centers to improve their chances of passing. How much more do law graduates have to pay a bar review center for extra classes to improve their chance of the passing the bar exams? 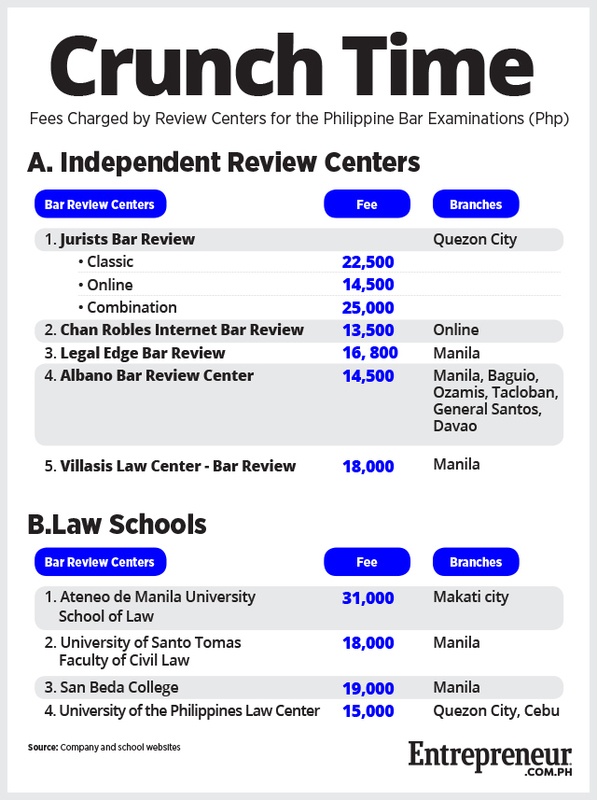 Based on Entrepreneur Philippines’ online survey of fees charged by both independent bar review centers and those ran by law schools, the fees vary widely from a low of Php13,500 to a high of Php31,000. The average is around Php18,000, which is equivalent to a semester in at least a couple of law schools. The review centers offer lectures, mentorship sessions and mock bar examinations in a classroom setting. The program would entail classes tackling the eight subjects included in the bar examinations with licensed lawyers and law professors serving as lecturers and instructors. 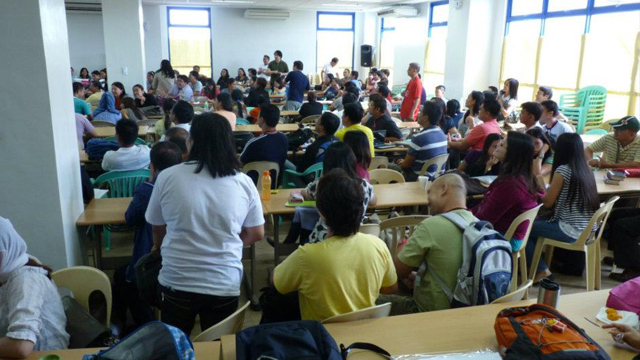 The programs usually last three to five months, with some even having sessions during the month of the bar exams. But in recent years, some review centers have begun combining their classroom-based programs with lectures accessible online for the convenience of examinees. Chan Robles Internet Bar Review and Jurists Bar Review are some of the review centers offering online classes. Bar takers may also take the option of foregoing the usual bar review programs done in class settings and just take the online classes. Fees for online reviews are also cheaper compared to the usual programs as they only range from Php13,500 to Php14,500. These fees for bar review classes and the growing number of law graduates taking them suggest it must be a lucrative business for those offering the review programs.